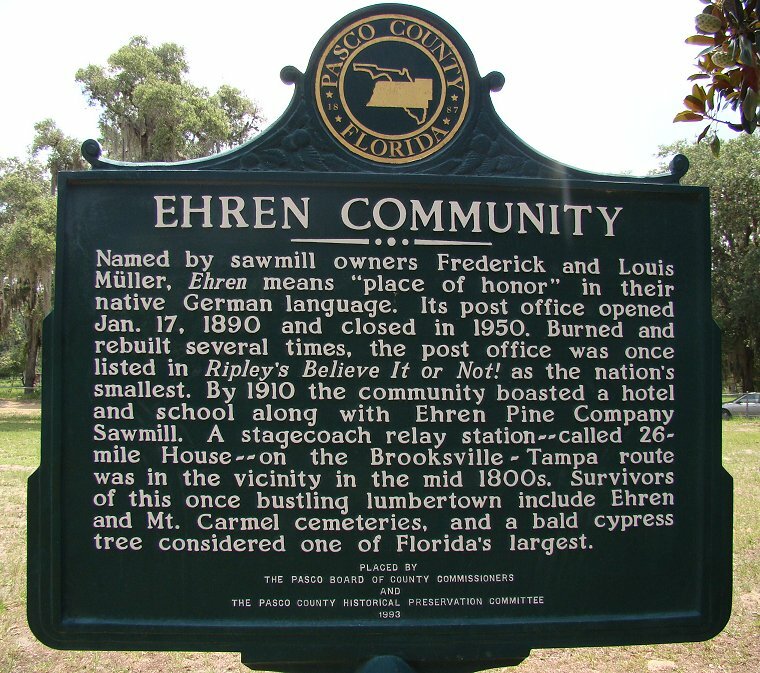 EHREN COMMUNITY HISTORICAL MARKER. This marker is located within the (white) Ehren Cemetery. The cemetery is located at the dead end of Ehren Cemetery Road, approximately 1.1 miles from its origin at Ehren Cut-Off (CR-583). Ehren Cemetery Road intersects Ehren Cut-Off approximately 3.4 miles south of SR-52 (5½ miles west of Interstate Highway 75), or approximately 2½ miles north of US 41 in Drexel. Drexel is approximately 3.8 miles north of the intersection of US 41 with State Road 54, just south of Land O’ Lakes. Ehren Cemetery Road is compacted lime rock for its first half mile, then graded dirt to this cemetery. According to MacManus, Frederick Ernest Müller named Ehren for his hometown in Germany.